The first proper trailer for Marvel's comedy space-opera Guardians of the Galaxy blew our minds last night, inspiring comparisons to Farscape and The Fifth Element. But who are all these people, and what's their deal? We've broken down the trailer frame by frame, to give you a Who's Who on the Guardians and their universe. They're one of Marvel's main cosmic superhero teams, saving worlds from aliens and massive threats from space. Originally, they were from an alternate future, in the 31st century, saving Earth from reptilian invaders — but the new version is in the present day, and they're a rag-tag group of misfits who came together in the wake of the brilliant Annihilation storyline. Basically all you need to know is that they're a motley bunch, and they joined together sort of by accident. And as you can see from the lineup, they're in space prison, imprisoned by the Nova Corps, who are basically space cops. Notice that Peter's "known associates" include Yondu, who appears not to be in the trailer. Yondu is one of the original Guardians of the Galaxy from back in the 1960s, and he's played in this film by Michael Rooker — he's a big blue guy with a mohawk. As the trailer begins, Star Lord is going inside what looks like an ancient tomb. In the first Thor movie, we glimpsed the Infinity Gauntlet in Odin's vault — and if you put all six Gems inside the Gauntlet, you get infinite power. Thanos, the villain we saw at the very end of Avengers, has been known to seek that power in the comics. So if this is one of the Gems, it's important. Or maybe it's just a cool orb? Either way, Thanos probably wants it. Here's our first glimpse of Star-Lord wearing his helmet and heading out to do some violence, with a gun in each hand. What are those robots floating around Star-Lord? Are they his companions? Or his captors? In either case, he doesn't seem too happy about them. Don't get cocky, kid. Star-Lord doing some tricky maneuvers in the middle of the big dogfight scene. Running across an alien landscape — towards something? Away from something? Heading out once again, to wreak some more mayhem. Love the spaceship interiors in this film. They all look fantastic. In the comics, Gamora (Zoe Saldana) is described as the "most dangerous woman in the Universe." She's a ruthless killer who is constantly looking for an excuse to murder people. You might have noticed in the readout above, Gamora is described as the last survivor of the Zenwhoberi race — her people were all wiped out by the Badoon, a nasty group of aliens who also killed Star Lord's mother. In the comics, she was adopted by the mega-villain Thanos, who trained her as an assassin. And here she is having a sword fight — based on the way this is cut and the scenery, it looks as though she's fighting Nebula, whom we'll meet soon. If you've read any of the Annihilation comics, then Drax (Dave Bautista) is already one of your favorite characters. He's a big powerhouse, whose abilities usually include Hulk-level strength and stamina — but he's got a heart of gold. He's smarter than the Hulk, but not by much. In most versions of the comics, he started out as a human but has been reborn as a kind of alien berserker. And here he is, going berserk. This is all most likely during a prison break from that space prison where the crew finds themselves. As the read-out says, Rocket Raccoon is a cybernetic/generic experiment on a lower life form. He originally appeared back in the 1970s. I highly recommend picking up the Incredible Hulk collection Pardoned, which includes an early Rocket Raccoon story, as well as some of the best Hulk tales ever. You'll notice that in addition to Groot, whom we're getting to in a moment, Rocket's main associate is Lylla. 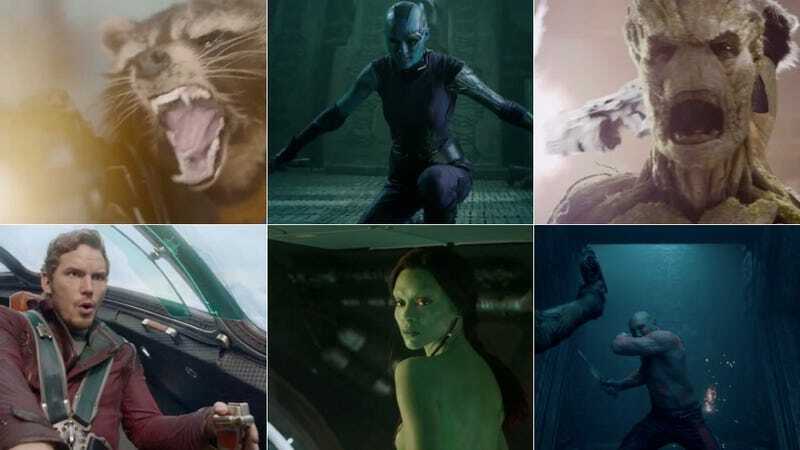 She's not in this trailer, and possibly not in the movie at all, but she's a talking otter, Rocket Raccoon's soulmate. Groot is basically an extraterrestrial plant monster, who's almost impossible to kill. In the recent comics, he and Rocket Raccoon are a duo, with Rocket risking death to go back for Groot on a few occasions. Groot can only say "I am Groot! ", but he conveys a lot of different meanings with that one phrase. Director James Gunn tells Total Film, "I love Groot so much I get teary eyed when I think of him sometimes. Essentially, all the Guardians start out the movie as bastards - except Groot. He's an innocent. He's a hundred percent deadly and a hundred percent sweet. He's caught up in Rocket's life, really." Let's just bask in the beautiful friendship between a raccoon and his plant monster friend. And once again, this appears to be a prison break. This is a separate scene, where Groot is throwing someone — probably one of the prison guards. Nebula (Doctor Who's Karen Gillan!) is one of a few villains in this film, and she's the one who's featured the most in the trailer. In the comics, she's a ruthless space pirate and sadistic killer, who is constantly trying to take advantage of other people's screw-ups to seize power for herself. This looks like the other side of that fight where Gamora is wielding a big sword. So it's Gamora's sword against Nebula's knives. In the comics, Nebula claims to be the grand-daughter of Thanos, who punishes her for her lies by turning her into a kind of evil zombie. We've already seen the Collector (Benicio Del Toro) on screen — he appears at the end of Thor: The Dark World, taking possession of the Aether, which is (as we mentioned) one of the six Infinity Gems. The Collector is up to no good, and probably wants to get hold of all of the Gems. Korath (Djimon Hounsou) is being described as yet another villain in this film — he captures Star Lord in the opening moments of the trailer. Korath is a Kree agent and an ally of Ronan the Accuser. He's also a brilliant cyber-geneticist who upgraded himself and devised a kind of "pursuer" matter that can track and capture anything or anyone. Those two guys with Korath are Kree agents. Or possibly Sakaaran Troopers — a toy labeled "Sakaaran Trooper" was being sold at Toy Fair this past weekend, and it looks a lot like those guys. Who are the Sakaarans? They're the natives of Sakaar, the planet where the Hulk gets stranded in the much-loved Planet Hulk storyline. But before you get excited, the Sakaarans probably won't have much to do in this movie beyond being cannon fodder, and their name is probably barely an Easter egg. Korath has never even heard of Star Lord. Poor Peter. Here's Korath coming out of his spaceship with more of those helmet guys, ready to do some dirty deeds. And now he's running across the battlefield, shooting everything in sight. Yup, that's John C. Reilly as a "Centurion" of the Nova Corps., who are probably best described (crudely) as Marvel's answer to DC Comics' Green Lanterns — they're basically space cops. The hero known as Nova aka Richard Rider, who's part of the Corps., is apparently not in this film. That's British comedian Peter Serafinowicz as his second-in-command. Yes, this movie has everybody in it. Not seen in these pictures: Glenn Close as Commander Rael, leader of the Nova Corps. In any case, the Nova Corps has captured the Guardians the Galaxy, and are keeping them locked up in space prison, until they escape. Which seems not to take long. And here's the real star of the movie: the Milano, Star Lord's spaceship. She's a thing of amazing beauty. In any case, the flying drones are causing tons of damage on the surface below. Here's a bunch of alien prisoners — any clue what race any of these belong to? Or if any of these are actually significant? And finally there's this random prison guard who takes Peter Quill's old-school Walkman. I couldn't identify him, or what race he belongs to — is he just a big ugly guard? Or is he supposed to be somebody from the comics? Also, James Gunn tells Total Film that the Walkman is Peter's only link to his lost home, Earth: "Hooked On A Feeling' is used in the movie. That and a lot of other old songs are on Quill's mixed tape in his Sony Walkman. It's one of the few things he has from Earth. I don't think of it as a joke, because it's very dear to him. It's the umbilical cord that connects him to earth and the home and family he lost." In any case, when Peter gets too upset about his Walkman, the guard gives him the smackdown with a force baton. Peter is going to get kicked around a lot in this movie, I have a feeling. ... So what did we miss?